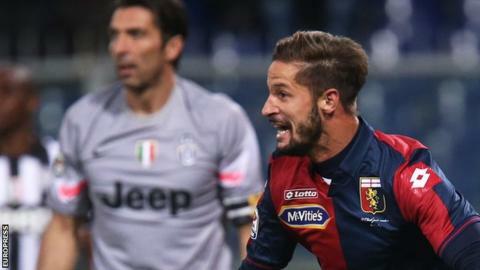 A 94th-minute Genoa goal inflicted a first league defeat of the season for Juventus and ruined a landmark night for goalkeeper Gianluigi Buffon. Buffon, 36, made his 500th appearance for the Italian champions and wore a special captain's armband. But his side wasted chances and twice hit the woodwork before home substitute Luca Antonini nudged home a winner to move his side ninth in Serie A.
Juve now sit joint-top with Roma, who beat Cesena 2-0 in the Italian capital. The defeat took the shine off a night that had been hyped around Buffon's landmark. "Next match in black and white will be my 500th. To celebrate I'll wear this special captain's armband," he tweeted in the build-up to the game. Buffon - the record-holder for clean sheets in Serie A - has won seven league titles with Juventus since joining for about £32m in 2001 - a fee which remains the most expensive ever paid for a goalkeeper. He is also Italy's record caps holder but his experience counted for little when Antonini - an 81st-minute substitute - connected with ex-Juve striker Alessandro Matri's cross. Moments earlier, Juventus striker Alvaro Morata had seen a goal-bound effort brilliantly saved by Genoa's Matia Perin. Massimiliano Allegri's side - beaten in the league for just the second time in 2014 - had hit the post through Fernando Llorente in the first half and defender Angelo Ogbonna midway through the second.